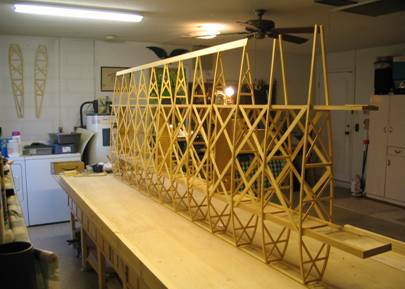 Once the compression struts are glued in, a lattice of geodetic bracing is glued to the top and bottom spar caps of both spars. Each geodetic strip is glued to both the front and rear spar, to the cap strip of each rib it passes through and to any other geodetic strip over or under which it passes. The resulting structure is very light, very rigid and very strong. The geodetics act as anti-drag braces, spar stiffeners and braces which keep the ribs resolutely vertical (no twill tape needed when covering). 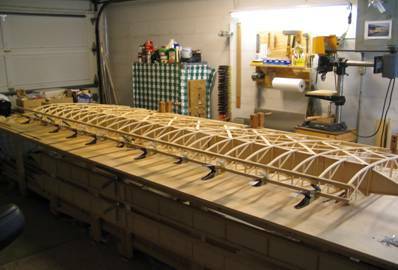 Partial ribs are then glued in between each of the full length ribs to provide strength and shape to the leading edge. 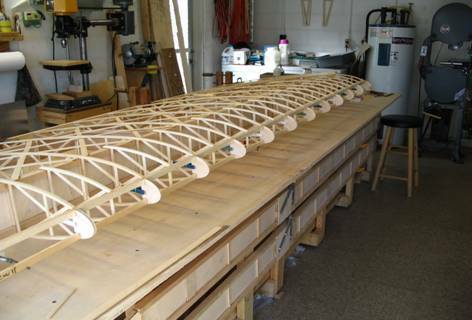 Since the ribs have a squared-off leading edge when built, rounded nose pieces must be glued to the leading edge of each full-sized rib, around which very thin (1/32”) plywood will be glued to provide a proper airfoil with a reasonably strong and smooth leading edge. 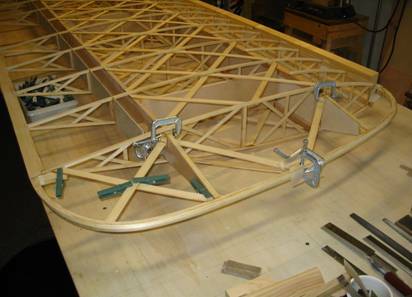 The previously laminated wingtip bow is glued into place and braced with more geodetic material. It is faired into the leading and trailing edges with block plane and sandpaper.